Ken Hoffman was the 2017 People’s Choice Award recipient at the Katz JCC Sports Award Dinner. According to Sherri Hoffman, her husband, Ken Hoffman, may sometimes go under the radar. She said as a man with a quiet and calm demeanor, he doesn’t collect a lot of attention, but on Wednesday, Sept. 13, Katz Jewish Community Center recognized Hoffman in a major way awarding him the 2017 People’s Choice Award at the organization’s seventh annual Sports Award Dinner held at the JCC. “I was really humbled and shocked that I would be nominated for something like this,” Ken Hoffman said. Each year, the JCC Sports Award Dinner pays tribute to community leaders making a positive impact on both the Katz JCC and local sports community. Former Philadelphia Eagles safety Brian Dawkins served as the keynote speaker at this year’s award ceremony. Hoffman has served as a coach with Katz JCC for the past seven years, and every year, his team has medaled, said Sherri Hoffman, vice-president of Katz JCC. Ken has coached in the Junior Maccabi Youth Basketball League and served as a baseball coach for Team South Jersey at the Mid-Atlantic Junior Maccabi Games as well as the JCC Maccabi Games. Ken Hoffman said he thinks his affinity for sports stems from his father. He said his father exuded a passion for athletics, and he passed it down to him getting involved in a sports during his high school years. It wasn’t until Hoffman’s own children were old enough to get involved in sports that he gave some consideration to coaching. 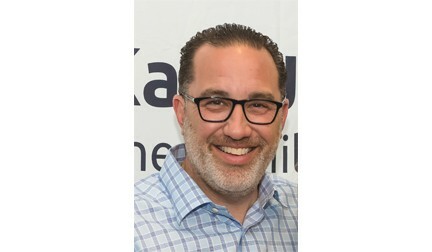 A father of three and owner of Deluxe Packaging, Hoffman started out coaching his son’s Little League team and served as baseball coach for Team South Jersey at the Mid-Atlantic Junior Maccabi Games before he got involved in Katz’s Junior Maccabi Youth Basketball League at his wife’s suggestion. The pair was looking for a winter sport for their kids, and JCC was looking for basketball coaches, so both Hoffman and his children signed up. For him, coaching isn’t about staying on the sidelines. His joy comes from getting on the field and teaching. He said he enjoys hitting ground balls to the kids or showing how to catch a fly ball. He has also found personal enrichment in coaching the JCC’s ACHaD Squadron special needs basketball program for the last three years. He said the players remember his name and are eager to see him return in the fall, and he’s equally eager to see them. Sherri Hoffman said kids have always gravitated toward her husband’s laidback coaching style. She said over the last seven years, Ken has given much of his time and effort to coaching. “It is important to give and to be generous, but it’s also important to be generous with your time,” Sherri Hoffman said. In recognition of his win, Hoffman’s photograph will hang on the foyer wall of the JCC. Sherri Hoffman said for the man with a quiet way about him, each time someone walks into the JCC, he’ll get a little recognition.